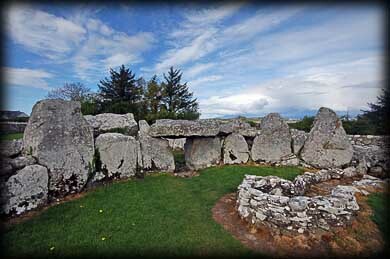 Without doubt the court tomb at Creevykeel is amongst the finest examples of a full-court tomb in Ireland. 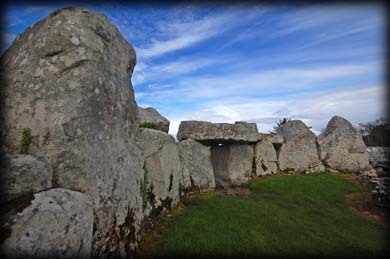 Dating from the Neolithic Period, 4000-2500 BCE, the tomb was excavated in 1935 and shortly afterwards restored. The excavations uncovered four cremation burials, decorated and undecorated Neolithic pottery, flint arrow heads, polished stone axes and other artifacts, including a chalk ball. The cairn is trapezoidal in shape and about 50 metres in length. 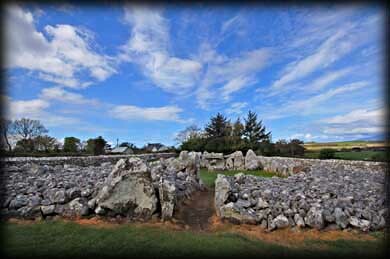 The front of the cairn is about twenty metres across. There is a narrow entrance passage, lined with orthostats, almost 5 metres in length leading to the large oval court. The court is also lined with orthostats that rest on the surface rather than sitting in sockets. At the north west of the court is a two chambered gallery. 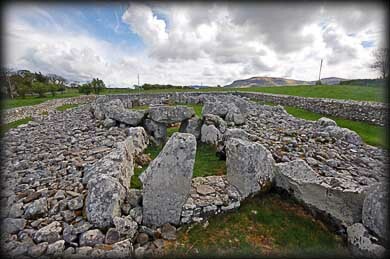 At the rear of the cairn there are three subsidiary chambers built into the cairn. Inside the court area a later kiln (pictured below right) was built and during excavations evidence of iron-smelting was found . This is an amazing site and I would strongly recommend that you take the time to visit this fine tomb the next time you are in the area. 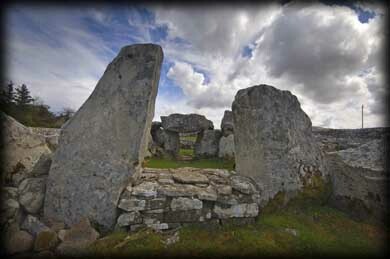 There are lots more lesser known megalithic sites in the area including the court tomb at Bunduff. Situated on the N15 Sligo-Bundoran road. 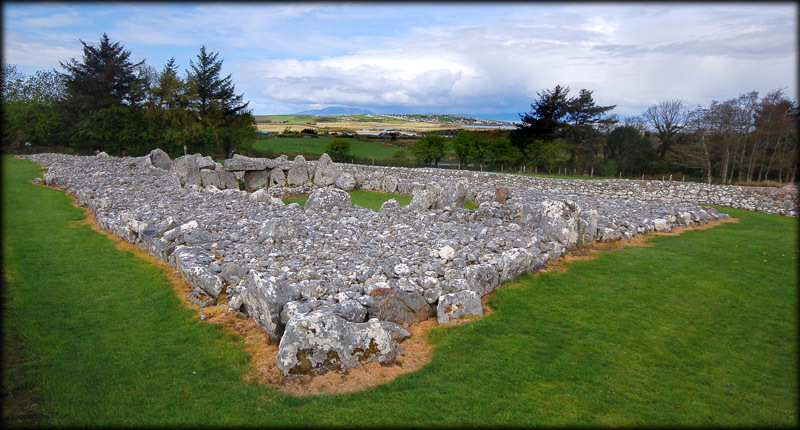 From Sligo City drive north on the Donegal road to Cliffony, at the second turn off for Mullaghmore is a crossroads, immediately after is a car-park on the right .The Court Tomb is situated behind the wall by the car-park. Discovery Map 16: G 7188 5456. Last visit Apr 2010.